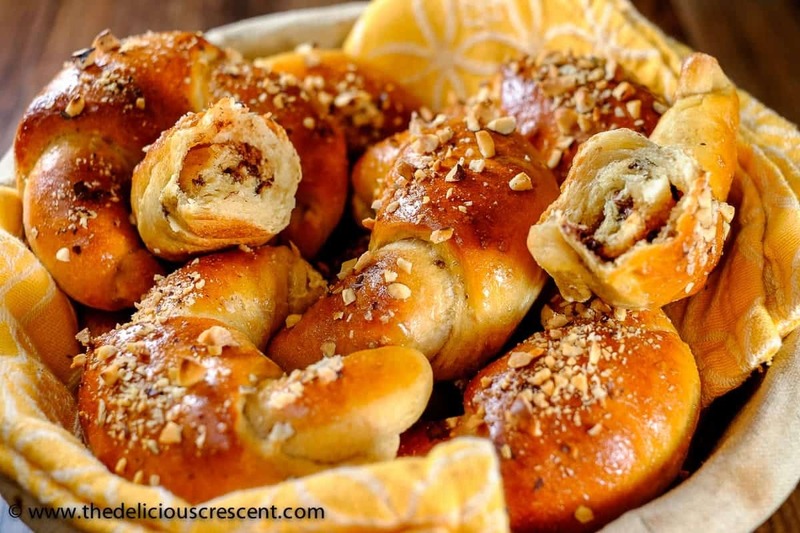 These Chocolate Hazelnut Honey Crescent Rolls are to die for!! Almost refined sugar free, with good fiber, flaxseed and healthy fats. 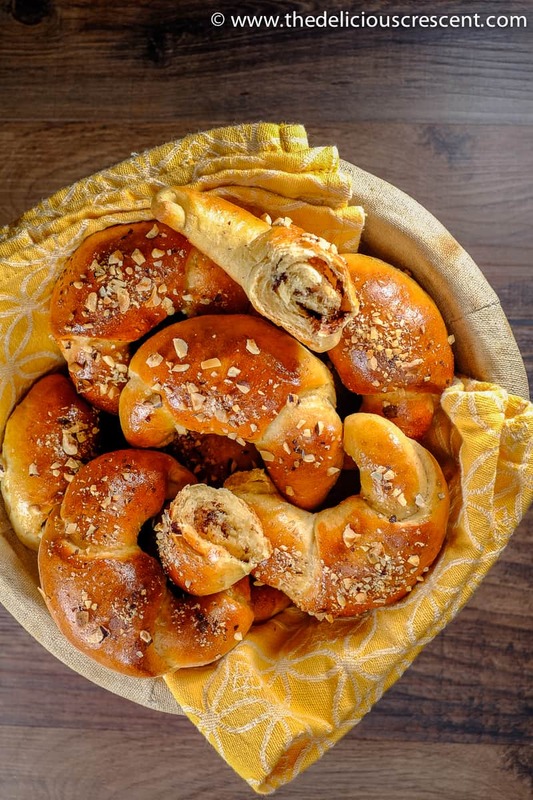 The inspiration for this chocolate hazelnut honey crescent rolls comes from a traditional German treat called nusskipferl. I was first introduced to those when my mother in law had gifted me a German cookbook, so many years ago. The common recipes for such a dough, use all butter, sugar and white flour. Here, I have used ingredients that improve the nutrition profile – so you can enjoy these with less guilt but with the same good taste. I also added some dark chocolate to give it a different twist. And believe me, these remind me of the mouth watering hazelnut spreads available in the market – that so many are crazy about. 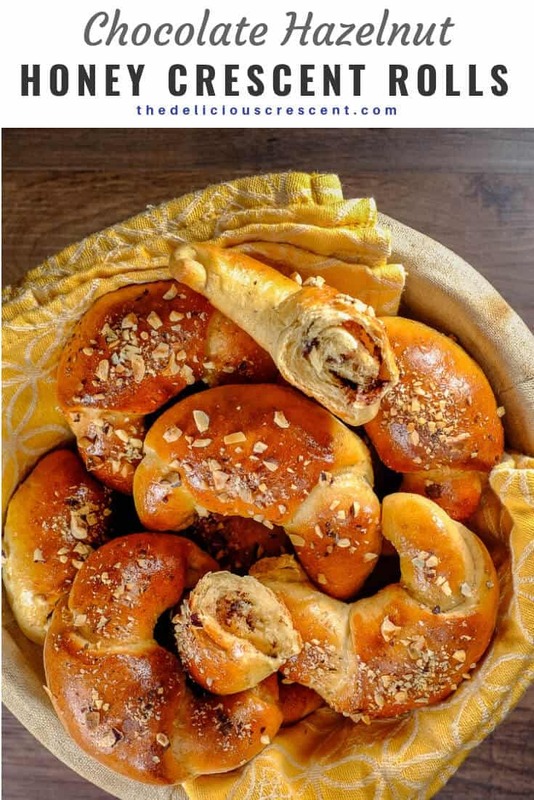 Except that, here in this recipe for chocolate hazelnut honey crescent rolls, you are using real nuts. Most hazelnuts spreads out there are quite unhealthy and use very little of the nuts. Hazelnuts are rich in protein, monounsaturated fats, iron, fiber, calcium, vitamin E and folic acid. Among the tree nuts, hazelnuts have the highest proanthocyanidin content, which are flavonoids that play an important role in decreasing the risk of cancer, heart disease, the risk of blood clotting, urinary tract infections and other chronic diseases. Some studies have shown that hazelnut consumption resulted in an improved blood lipid profile. These nuts are rich sources of oleic acid and therefore considered to be heart healthy. Dark Chocolate is rich in flavonoids, which are powerful antioxidants. Research has shown other potential health benefits – such as improved blood flow and lowering of blood pressure. The fat in good quality chocolate comes from cocoa butter, which is made up of oleic acid, a heart healthy monounsaturated fat, palmitic acid and stearic acid. Although, these latter two fatty acids are saturated fats, stearic acid is considered to have a neutral effect on cholesterol levels. And palmitic acid makes up a smaller percentage of the total fat in good quality chocolate. Some lower grade chocolates may use other fat sources. The data from the Physicians health study suggested that some chocolate consumption was associated with lower risk of ischemic heart disease and myocardial infarction. So, good dark chocolate in “moderation”, may have beneficial health effects. But, it also has sugar, and therefore should not be consumed in excessive amounts. And too much of it can be fattening. I have used wheat bran and flaxseed meal for this recipe and have discussed about these in my post – Healthy Persian Barbari bread. Enjoy these straight out of the oven, with all the melted chocolate inside! 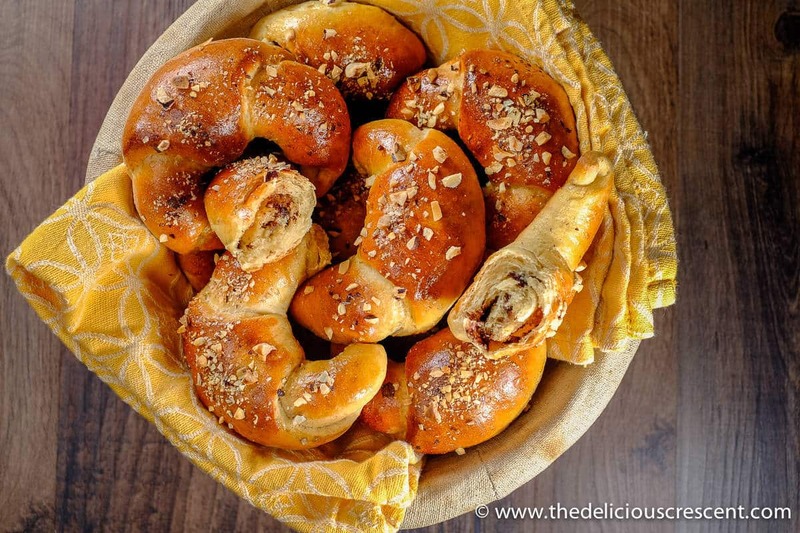 These chocolate hazelnut honey crescent rolls are not going to last for too long. Kids are going to love it! Take the warm milk, sprinkle the yeast over it. Scatter the sugar on the top. Let it stand in a warm dark place for about 10 to 15 minutes until the yeast bubbles/foams up on the surface. Add 4½ tablespoons olive oil, 3½ tablespoons honey, 2 eggs, and then about 3½ cups of the flour, salt and mix lightly. Give it just a few minutes for the flour to absorb the moisture. Then add the bran and flaxseed meal and mix it in. Gradually add another half cup or more flour as needed to make a dough that is not too sticky. Knead well. If it is just a little sticky its okay. As the dough will later absorb the moisture. It is important to use as little flour as possible and to not make the dough very dense. Let the dough rise to double its size. This may take time. It varies between one hour to 2 or more hours. Give it time to nicely rise. Preheat the oven to 275ºF (135ºC). Toast the hazelnuts in a single layer on a baking sheet for about 15 - 20 minutes until the skin cracks. Let the hazelnuts cool completely. Rub the skin off the hazelnuts. Grind the nuts in a food processor until fine. Mix with honey and vanilla to make a soft dough like mixture. Divide into 24 portions. Once the yeast dough has doubled in size, punch it down and divide into 4 equal portions. Roll each of these portions into a round disc about 1/2 inch thick. Lightly apply some olive oil over the disc and cut it into six triangles. Take one portion of the honey hazelnut mixture and evenly spread it as tiny bits all over the triangle. Sprinkle one teaspoon of chocolate chips all over. Starting from the broad end of the triangle roll up tight and shape it into crescents. Make sure to pinch and seal the edges well. Place the crescent rolls over a parchment lined baking sheet, making sure to space them apart by 2 inches to allow enough room for the rolls to rise. Allow the chocolate hazelnut honey crescent rolls to rise until double the size. This may take up to 30 minutes. Brush beaten egg on the surface of the chocolate hazelnut honey crescent rolls. Sprinkle the crushed hazelnuts on the top. Bake for 15 to 20 minutes until they are nicely browned on the top. 2. When oil is used in place of butter in a recipe, it is usually needed in a reduced amount than the butter that would be needed. I would only use light olive oil as the flavor is not so strong. For this recipe 1/2 cup butter would have been needed. 3. When honey is used in place of sugar, it is usually needed in smaller quantity and adjustments are made to the amount of liquid added. For this recipe 5 to 6 tablespoons sugar would have been needed. (d) Placing the dough or the rolls in an oven that has not been preheated and with a pan of hot water one level below the container/baking sheet will help the dough rise better. Thanks Danielle. Yes I would love them anytime! This looks LEGIT! Those prep pics are fabulous too! So helpful! I love it!!! Thanks Camilla for your lovely feedback. There’s just something about chocolate and hazelnut that fancies up any recipe! Yum! Absolutely I agree! Thanks Lisa. I bet the kitchen smells amazing while these are baking! They are perfect for weekend brunch! Yes definitely. And when they come out of the oven warm and with the melted chocolate they are so tempting. Thanks Jessica. 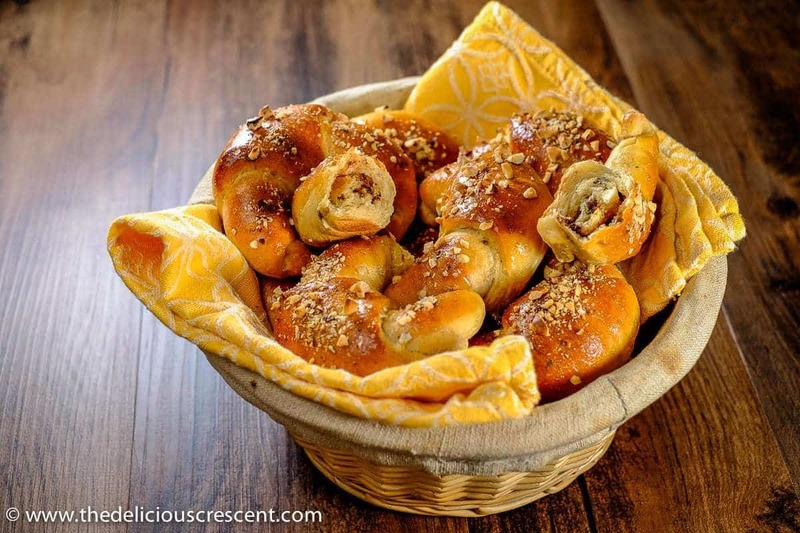 Thanks for this easy to follow crescent roll recipe! YUM. I love hazelnut so much. Thanks so much for sharing!